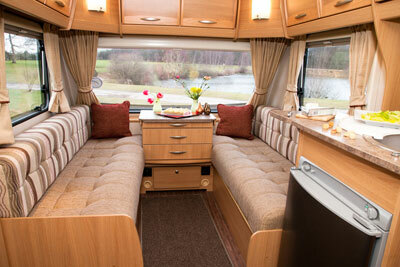 First impressions of the Xplore 540 caravan are of a light, bright lounge and that’s because the window is a single unit, rather than three, so it lets in more light. In this layout, this big window more than makes up for lack of window in the door. But there’s something very positive about this windowless door. Instead of the usual rubbish bin, this one has a magazine rack attached to it. That’s far more appropriate to the lounge than a smelly bin. There are lots of ways in which the Elddis design team has saved weight and cost to bring us the opportunity to achieve the luxury layout of a permanent bed at a budget price. One of them is by the absence of drop-down hatches to gain entry to under-settee bedding lockers; you get in by raising the top. And the hinges aren’t designed to hold up the base while you grovel inside. But at this money, few are going to object to propping up a settee base. The Xplore 540 has a single, central strip of carpet, rather like a long rug, running from the front end of the bed to the front end of the lounge. The upside is that this strip is easy to take outside to shake off any bits and, all around it, the bamboo-effect vinyl floor covering is visible and makes a positive contribution to the décor. The downside is that the vinyl is much colder under your toes than carpet. Put a doormat on your shopping list as the mat that’s built into the 540 is too narrow to be of any sole-scrubbing use and certainly too small to place a couple of pairs of shoes as you take them off on your way in. This layout gives you the luxury of a separate shower, although the bi-fold plastic door lacked rigidity and the turn-clip that secures it open is fitted a fraction too close to the top of the door. The result is that you have to gently ease the clip upwards to put the door into place or it could crack the shower door. There’s nothing economy-standard about the 540’s mattress – its thickness and firmness is everything you’d expect from a good quality domestic bed. 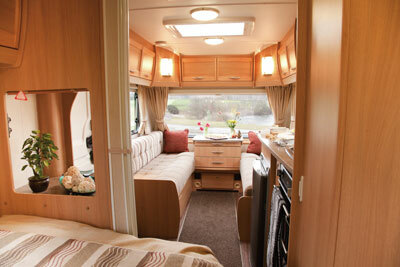 Elddis’s designers have shaved cost and weight where they could but they’ve got the basics right. 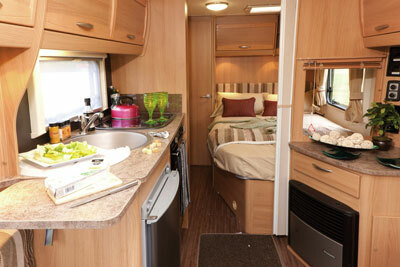 This caravan’s main points are its bed and roomy full-end shower room. Enjoy the big front window, forget there’s only one wardrobe door. All you need is here. Best of all, this caravan is at a price that will persuade you to buy new when otherwise you might have had to settle for something used. 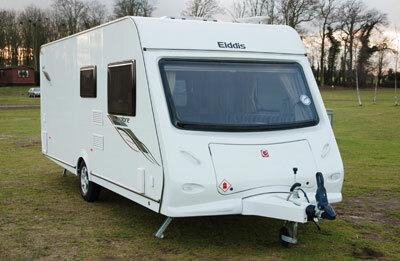 When Elddis added a fixed-bed, end shower room model to its budget-priced Xplore range the manufacturer suddenly brought this popular layout within range of £13,000 budgets. It’s also within range of mid-sized cars, at 1400kg MPTLM. I like the idea of the fixed bed and separate dining there being just the boss and myself, but as for getting up and being embarrassing to your guest does that not apply if you have to make the extra double up anyway.